Located in Casablanca, Le Zenith Hotel is in the business district, a 4-minute drive from Hassan II University and 6 minutes from Casanearshore Park. Featured amenities include complimentary wired Internet access, a business center, and express check-in. 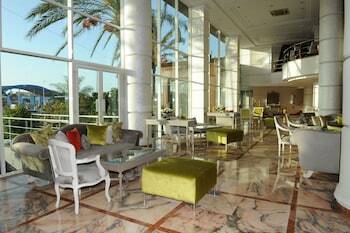 Planning an event in Casablanca? This hotel has 452 square feet (42 square meters) of space consisting of conference space and meeting rooms. A roundtrip airport shuttle is provided for a surcharge (available 24 hours), and free self parking is available onsite. Located in Marrakech (Medina), Riad Faiza and Spa is within a 15-minute walk of Jamaa el Fna and Dar Si Said Museum. Located in Fes (Fes El Bali), Dar Ahl Tadla is within a 15-minute walk of Medersa Bou-Inania and University of Al-Karaouine. Featured amenities include a 24-hour front desk and a library.